Private home dining is all the rage in the west, but is something that’s unheard of in Hyderabad. I mean, stepping into a stranger’s house for dinner might sound a little crazy, but that risk is well rewarded at this intimate dining room in Banjara Hills. 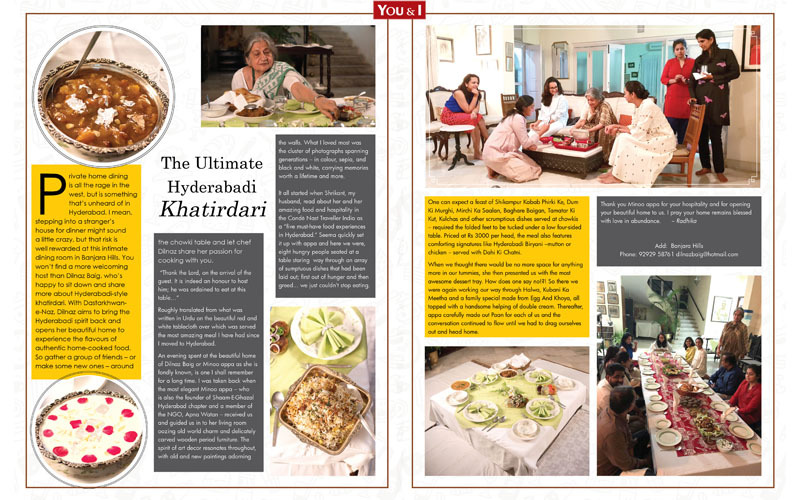 You won’t find a more welcoming host than Dilnaz Baig, who’s happy to sit down and share more about Hyderabadi-style khatirdari. 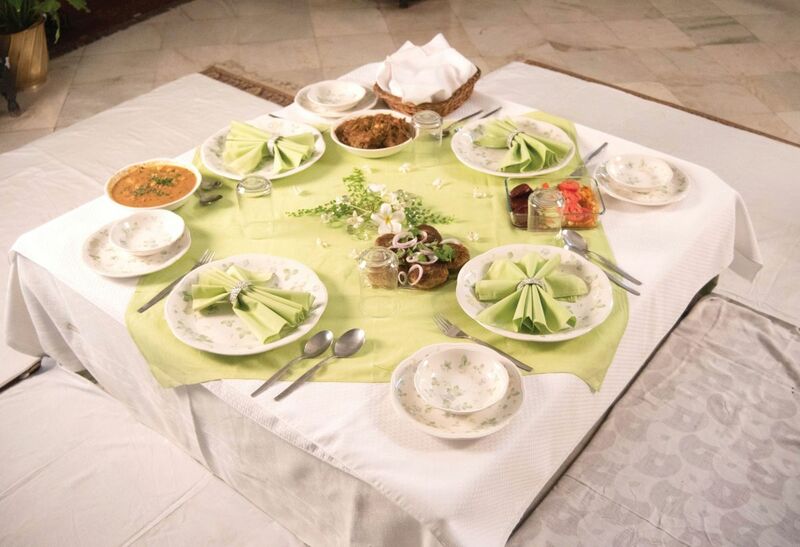 With Dastarkhwan-e-Naz, Dilnaz aims to bring the Hyderabadi spirit back and opens her beautiful home to experience the flavours of authentic home-cooked food. So gather a group of friends – or make some new ones – around the chowki table and let chef Dilnaz share her passion for cooking with you. Roughly translated from what was written in Urdu on the beautiful red and white tablecloth over which was served the most amazing meal I have had since I moved to Hyderabad. An evening spent at the beautiful home of Dilnaz Baig or Minoo appa as she is fondly known, is one I shall remember for a long time. 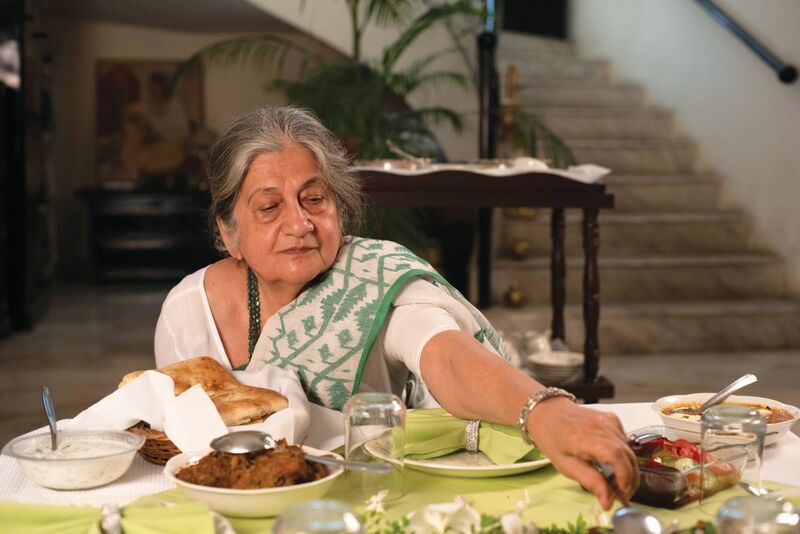 I was taken back when the most elegant Minoo appa – who is also the founder of Shaam-E-Ghazal Hyderabad chapter and a member of the NGO, Apna Watan – received us and guided us in to her living room oozing old world charm and delicately carved wooden period furniture. The spirit of art decor resonates throughout, with old and new paintings adorning the walls. What I loved most was the cluster of photographs spanning generations – in colour, sepia, and black and white, carrying memories worth a lifetime and more. It all started when Shrikant, my husband, read about her and her amazing food and hospitality in the Condé Nast Traveller India as a “five must-have food experiences in Hyderabad.” Seema quickly set it up with appa and here we were, eight hungry people seated at a table staring way through an array of sumptuous dishes that had been laid out; first out of hunger and then greed... we just couldn’t stop eating. One can expect a feast of Shikampur Kabab Phirki Ke, Dum Ki Murghi, Mirchi Ka Saalan, Baghare Baigan, Tamatar Ki Kut, Kulchas and other scrumptious dishes served at chowkis – required the folded feet to be tucked under a low four-sided table. Priced at Rs 3000 per head, the meal also features comforting signatures like Hyderabadi Biryani –mutton or chicken – served with Dahi Ki Chatni. When we thought there would be no more space for anything more in our tummies, she then presented us with the most awesome dessert tray. How does one say no!?! So there we were again working our way through Halwa, Kubani Ka Meetha and a family special made from Egg And Khoya, all topped with a handsome helping of double cream. Thereafter, appa carefully made out Paan for each of us and the conversation continued to flow until we had to drag ourselves out and head home. 3 Face Packs To Beat That Tan!